While my intent was never to hijack a movement, or to be forgiven for taking much too long to knee in solidarity, I believe it is important to acknowledge and respect these objections. I’d therefore like to offer an alternate strategy to peacefully protest the misogyny currently running rampant in our country. 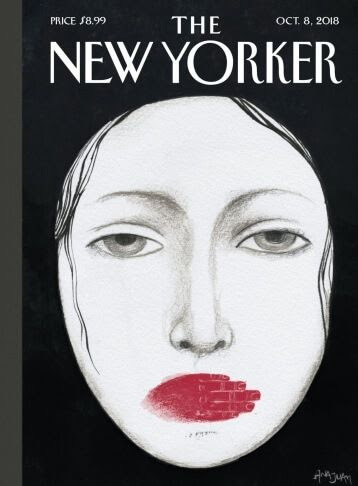 Inspired by the front cover of The New Yorker magazine’s Oct. 8th issue (see below), I’m asking all supporters of gender equality, whether you are a woman or a man, and regardless of which marginalized group(s) you belong to, to consider placing your right hands over your mouths, instead of your hearts, when the national anthem plays. This will serve as a peaceful demonstration against the unfair and unjust silencing of women for speaking our truths. This will also allow individuals who wish to take a knee in solidarity with the #BlackLivesMatter movement to do both, take a knee and put your right hand over your mouth, without one replacing the other. “…that is exactly what Republicans have consistently been able to count on; that demonstrations will be too little, too late, and that most members of a marginalized community will protest to support only those issues that represent them, rather than banding together as one for all. If we did, Republicans would lose, every single time. If we did this, Republicans would lose, every single time. I carry the memory of living under terror…knowing that I or any member of my family could be killed with impunity, and yet I was called a terrorist.